The applet illustrates a variant of Desargues' theorem. 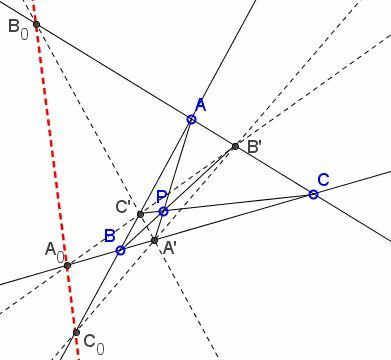 In ΔABC cevians AA', BB', CC' meet in point P. The lines AB, A'B' meet in C0, AC, A'C' meet in B0 and BC and B'C' meet in A0. Then the points A0, B0, C0 are collinear. The fact that the given cevians are concurrent, tells us that the triangle ABC and A'B'C' are perspective from a point (P in our notations. A'B'C' is a cevian triangle of P.) By Desargues' theorem, the triangles are also perspective from a line. In other words, the points A0, B0, C0 of intersection of the corresponding sides of the two triangles are collinear. The line they lie on is called the polar of point P with respect to ΔABC. Point P is known as the pole of that line with respect to ΔABC. Sometimes they are referred to as trilinear pole and polar with respect to the triangle. (CAC'BB) = B'C/B'A : B0C/B0A = -1. (1) AC'/C'B · BA'/A'C · CB'/B'A = - AC0/C0B · BA0/A0C · CB0/B0A. AC0/C0B · BA0/A0C · CB0/B0A = -1. Thus, if three points on the sides of a triangle satisfy Ceva's concurrency condition, their harmonic conjugates with respects to the vertices of the triangle satisfy Menelaus' collinearity condition, and vice versa. The two theorems are indeed equivalent.